East meets West! Combining Green Tea and Greenthread makes a wonderfully soothing drink! 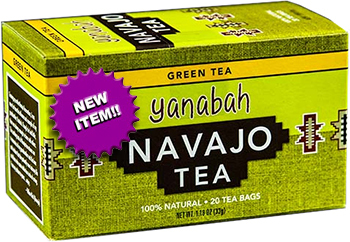 YANABAH NAVAJO AND GREEN TEA: East meets West! Combining Green Tea from the mountainous Hunan region of China and blending it with our Traditional Navajo Tea made from the herb Greenthread, a plant used for centuries by the Navajo, provides a drink that is healthy, soothing,, and without the bitter taste. Whether you are greeting the sun as it rises in the East or thanking the Great Spirit as the sun sets in the West, Yanabah's Navajo and Green Tea mixture will be wonderfully energizing to your senses. Yanabah is Navajo for Grandmother. Contains: Greenthread herb, green tea. 100% natural. Caffeine free! 20 tea bags.